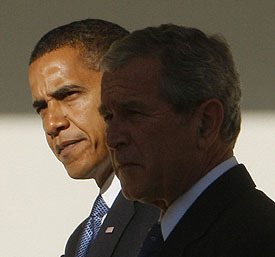 President Barack Obama is morphing into George W. Bush, as administration attorneys repeatedly adopt the executive-authority and national-security rationales that their Republican predecessors preferred. Gay rights groups expressed dismay with the Obama administration Friday over its championing of the Defense of Marriage Act, a law the president pledged to try to repeal while on the campaign trail. As a candidate for president, Barack Obama wooed environmentalists with a promise to “support and defend” pristine national forest land from road building and other development that had been pushed by the George W. Bush administration. But five months into Obama’s presidency, the new administration is actively opposing those protections on about 60 million acres of federal woodlands in a case being considered by the U.S. 9th Circuit Court of Appeals. ….Whatever the strategy, the result has been a series of cases in which President Obama appears to be taking positions in court that run counter to his stated goals….The Interior Department this spring, for example, defended a Bush plan to lease western Colorado’s picturesque Roan Plateau for oil and gas drilling….Administration lawyers have also fought environmentalists in court over a coal mining technique known as mountaintop removal. Hope and change, baby, hope and change.